The museum has an exceptional collection of steam locomotives. The focus in recent years has been restoration to operating condition, first of Frisco 1630 and then of Shay 5. However, while we may restore other locomotives to operation, we are very conscious of the need to cosmetically restore and conserve many locomotives even if those unlikely be operational in the near term, if at all. Even cosmetic restoration involves extensive cleaning, de-rusting and repainting as well as some repair work to allow a locomotive to be properly displayed. The first locomotive restored in this way is the Rock Island 4-6-2 Pacific 938, which was completed in 2017 and is now on display in Barn 9. The objective of this project to consider the steam collection as a whole and carry out a program of restorations based upon need and resources. The next target is expected to be the Illinois Central Mogul 3719. Such work involves significant cost, whether the decision is to restore to operation or cosmetically for display. 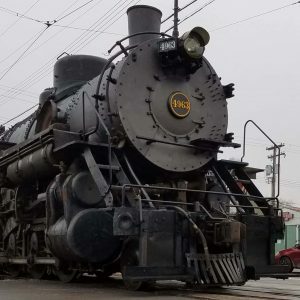 Donations in support of this project will help preserve these historic locomotives for future generations and improve the displays that we can provide to our visitors. The Illinois Railway Museum has an exceptional collection of steam locomotives. The focus in recent years has been restoration to operating condition, first of Frisco 1630 and then of Shay 5. However, while we may restore other locomotives to operation, we are very conscious of the need to cosmetically restore and conserve many additional locomotives, even those unlikely be operational in the near term, if at all. Even cosmetic restoration involves extensive cleaning, rust removal, and repainting as well as some repair work to allow a locomotive to be properly displayed. 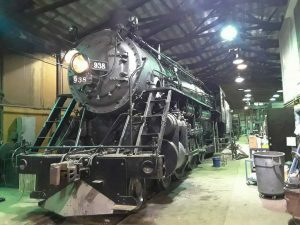 The first locomotive restored in this way was the Rock Island Pacific 938, which was completed in 2017 and is now on display in Barn 9. The objective of this project is to consider the steam collection as a whole and carry out a program of restorations based upon need and resources. The next target is expected to be the Illinois Central Mogul 3719.